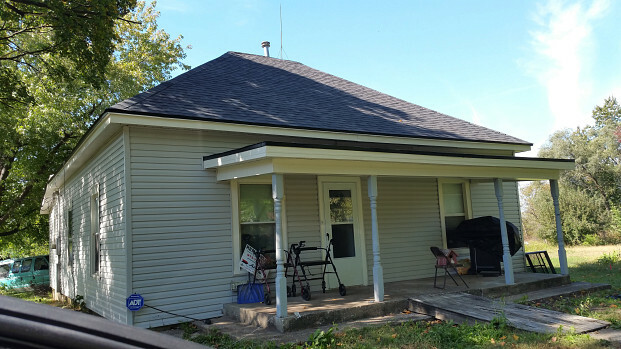 WHAT OUR NETWORX CONTRACTOR DID FOR US: Replacement of siding and decking. WHY I CHOSE HIM: Good online reviews; reasonable, all-inclusive price. It started out with our insurance company sending out a claims adjuster to look at our roof. He didn’t seem to think that the roof needed any repair, although he did say, “Your siding definitely needs some work.” (The siding, which was steel, had wind damage as the result of several storms.) My wife, who was out there with the adjuster, said, “We can’t afford it,” but he told us that the company would pay to replace the siding. So that’s where we started from. I got about 4 or 5 bids but most of them were too high, especially because we had to pay the contractor ourselves and then get the money back from the insurance. There was a special deal on one contractor referral site, but they were going to cover just one layer of shingles. I found out that we had shaker shingles in the front, so I knew the decking would have to be replaced, at least the whole front. They only allowed maybe 3 sheets of decking. So I decided to go with Arrow Renovation & Construction LLC, who were offering total replacement of everything. Their price wasn’t that much higher than the special; in fact, there was only about a $20 difference. I looked at their online reviews before hiring them, which seemed to be pretty good. The reviews and the estimate together were the deciding factor. The job took them two days, plus another morning. They really did a good job on the house itself. I’ve had several compliments on how the house looks. The only downside was all the nails that they left scattered around. We’re still finding nails! The insurance company seems to be satisfied; they came out and looked at it. We’re waiting to hear back from them, but we should be good for redoing our insurance at a slightly cheaper rate. For anyone that wants to hire a contractor, my advice would be look at their references, make sure they’re insured, and don’t always go with the cheapest estimate. Electrical Installation as Part of a Living Room-to-Office Conversion by Cara B. Kitchen Remodel: More Space and a Cozy Family Hangout by Lilo L.